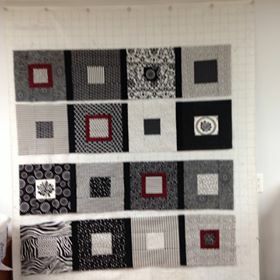 I’m behind on posting pics on my blog and just wanted to show you a lap quilt I did on Pat Sloan’s quilt along in May. 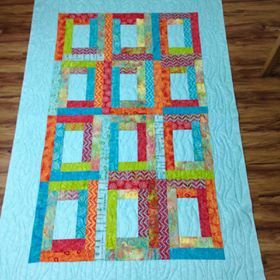 I call it my Siesta Quilt and its a nice bright quilt and perfect for a little afternoon siesta. For a closer look it can be seen at Artisans On Main-Montague. 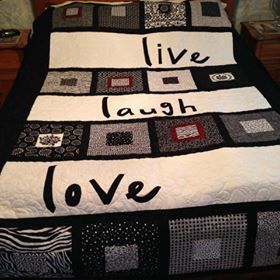 I was commissioned to make a Black and White Quilt with a pop of Burgundy in it with the Quote Live, Laugh, Love . A very simple design and yet I had trouble choosing fabrics to create this one. Once I gathered all the different fabrics it pieced together beautifully. 3 comments - Add your comment! Promised myself I would blog more often , but that seems to have fallen apart. Here it is the first week in August and I haven’t written a thing. The B&B has been steady, lots of wonderful , colourful people have graced our little B&B. It amazes me all the people that I have met and where they have been and what they have done or are doing in life.